A few months ago, when I was looking to escape the chill of Bogotá, I decided to head to Villeta for the weekend, which is about 2 hours out of the city. It was there that I relaxed in the warm heat and swam in a small hotel pool with 20 other Colombians (it was a public holiday), most of whom decided it was a good idea to bomb dive in from the second story building close by. After a swim, followed by a walk into the town centre, it was was here in Villeta that I discovered the delicious Caleño drink, Cholado. It sounds pretty interesting – condensed milk, fruit, cordial and topped with Milo, but I promise you, it’s delicious. If you’re playing along at home, here is the recipe. Have you tried Cholado? Or do you have a variation of the recipe? Be sure to let me know about it! Chop all your fruit into bite-sized pieces and set aside. Shred you ice in a blender and scoop into two large cups. Add one cup of strawberry syrup or cordial to each cup. Add your pawpaw and mango then add another large teaspoon of ice then top with banana, lulo, passion fruit and drizzle with the sweet condensed milk to taste. The more the better really. Garnish with a teaspoon of Milo to each cup and nosh away! You can thank me later. Have you tried a cholado? Did you love it? Or perhaps you’ve fallen in love with other tasty snacks in Colombia? Let me know about it in the comments section below. Sounds yummy! I just noticed I miss maracuyá. Oh yes, love maracuya y lulo! 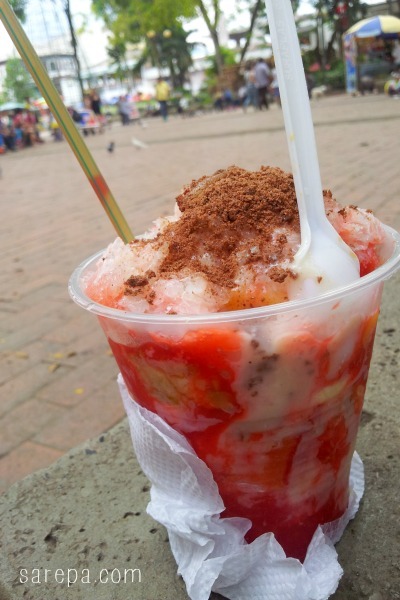 Pingback: Foodie Fridays: Street Food in Bogotá | sarepa.